Ah, Keating, there was a man who could chew them up and spit them out. He didn’t need to repeat himself over and over while he thought of the next word to say in a pathetic attempt to form a whole sentence as Abbot does. He churned out dialogue at a remarkable rate as his mind leapt out in front to choose from a cornucopia of comments he wanted to express. His verbal banter barraged his opponents like a flooded river hits at the shores tearing at the edge of their debate till the walls collapsed. Abbott is barely able to complete a coherent sentence in most of his diatribes. They are typically either so full of gaffes or misspoken expressions that it is a wonder he can make a speech himself at all. In fact, he once complained in that infamous ABC interview in 2010 that we could only be assured he wasn’t stretching the truth was if he was expressing himself from an “absolutely calm, considered, prepared, scripted remark”. It seems carefully scripted dialogue — probably written by someone more articulate — is the only way he can even tell the truth, much less string a series of coherent sentences together. This is our national statesman? Is it no wonder Germaine Greer on Q&A once said, ”For me, the biggest mystery is that Tony Abbott is a Rhodes scholar” to roars of approval from the crowd and the anger of right-wing columnists. 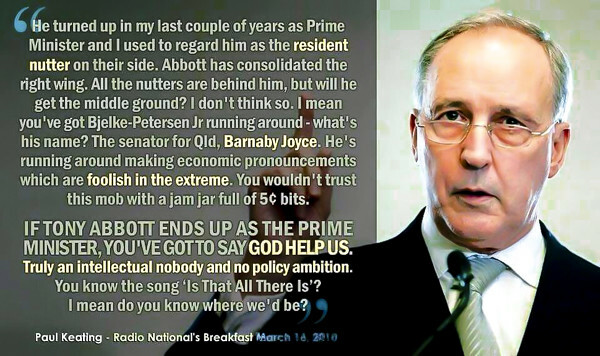 Keating, love him or hate him, was as adroitly articulate on his feet as Abbott simply isn’t, even in a scripted speech. There couldn’t be two Prime Ministers further apart in intellect.